That would make an interesting story in itself, but this one's more complicated. 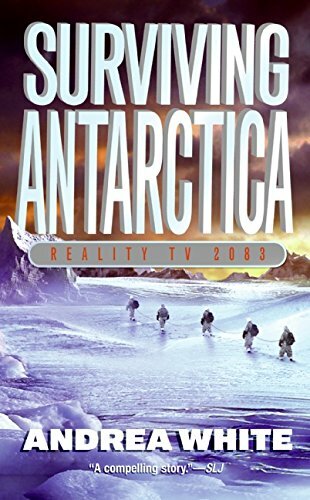 It's set in a not-that-distant future, where society is kept in line by a kind of bread-and-circuses setup, constant floods of TV including more and more extreme "reality" shows, as a way to distract everyone from everything from climate change to economic and political issues. There are also restrictions on higher education, with a lottery for kids who wouldn't otherwise qualify - one of the main characters has lost out on this lottery, putting him in a blue-collar role that eventually lets him help the kids from the main cast. As for the Antarctic challenge, it's set up as a great opportunity, with a cash prize for completing the quest. Lots of people sign up, with five chosen; one of them's a girl from an Inuit tribe who, due to climate change, was relocated along with her entire village to a Hopi reservation in the American southwest. I got a kick out of this cross-cultural view of two very different indigenous peoples - and as Grace only knew of her people's Arctic lore from stories, her challenges in training sled dogs and dealing with actual snow and ice were intriguing. I enjoyed the ups and downs of the quest, from the historical details made available to the kids (one of whom is a distant relative of Birdie Bowers, one of Scott's final five and perhaps the most tough and resourceful and hard-working and selfless members of the entire Scott expedition) to the challenges of the Antarctic. (Yes, climate change has shrunk the ice cap - but there's still a LOT of ice down there, with glaciers and crevasses and ice floes and storms.) The gradual rebellion of the support staff on the TV show is also fun, and quite suspenseful: will they be able to save the kids? While some aspects of the story stretch credibility a bit, even allowing for the tech that's described here, I enjoyed it. And I couldn't help imagining it as a movie or perhaps a mini-series, though that might wind up being a bit too meta! I plan to take this book to this afternoon's BookCrossing Meetup at Panera. If nobody claims this one I'll retrieve it to release elsewhere. Hope someone enjoys it! Caught! Initially, I passed it over, but Gory's description won me over.